Background: Electronic monitoring of physiologic variables has gained widespread support over the past decade for critical patients in the intensive care setting. Specifically, anesthesiologists have increased the emphasis and practice of hemodynamic control through monitoring cardiac output (CO). However, these physicians are presented with several options in terms of how they wish to study the trend of this physiologic parameter. Materials and Methods: A survey was distributed to 250 general and subspecialty-trained anesthesiologists. 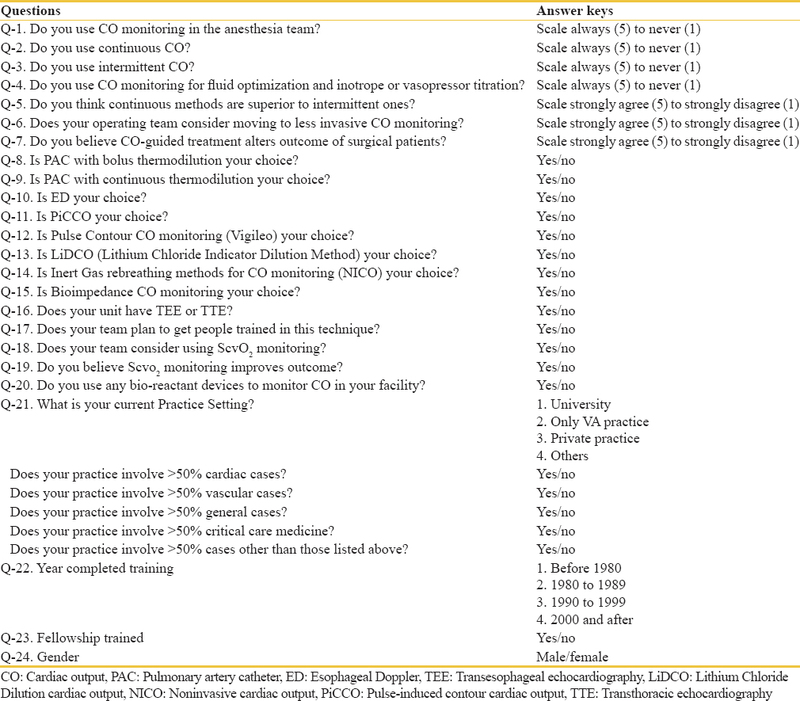 A series of questions were presented in terms of preference of patient monitoring methods requiring yes or no answers. Anesthesiologists were asked about subspecialty training, years since residency graduation, and preferences toward specific hemodynamic monitoring tools. Nonparametric statistical analysis and Chi-squared tests were used to analyze both normal and nonnormally distributed data. Results: CO monitoring devices were implemented by 106 out of 133 anesthesiologists, with 98 of these physicians utilizing CO monitoring for fluid and vasopressors response. Of the physicians implementing a monitoring device, 48 out of 107 physicians preferred pulmonary artery catheter, while pulse contour analysis was preferred by 17 anesthesiologists. An echocardiography unit was available to the department for 90 anesthesiologists, and 77 anesthesiologists were trained to use this technology for monitoring cardiac function. Conclusion: Many anesthesiologists have placed emphasis on the importance of CO monitoring within the intensive care setting. However, physicians are still faced with multiple options in terms of how they wish to specifically monitor this hemodynamic variable. Factors that influence such decisions include the time of physician's residency training along with patient and clinical case characteristics. Advanced hemodynamic monitoring in high-risk patients has gained widespread support over the past decade throughout intensive care settings. In addition, there has been an increase in the number of alternatives for monitoring cardiac output (CO). This transition in patient management may have been influenced by a better understanding of methods and criteria used to compare the devices. The implementation of electronic physiologic management devices was rooted in studies completed over the past several decades. Today, clinicians are faced with an increasing number of medical devices to choose from to monitor physiologic variables in patients. In our opinion, the extent to which these tools are utilized is based on availability along with the experiences of individual physicians using the devices. However, the utilization of different tools for assessing physiologic data has been shown to be valuable only if the clinician understands the basic principles behind these technologies. We used the Delphi method which is a forecasting method based on the results of questionnaires sent to a panel of experts. Several rounds of questionnaires were sent out, and the anonymous responses were aggregated and shared with the group after each round. The expert panel included physician anesthesiologists with the rank of professor or directors of anesthesia and critical care services. The surveys were distributed to 250 anesthesiologists as a random sample, at 125 out of 175 Veterans Health Administrations using SurveyMonkey through an anesthesiology group mailing list. The response rate was above 50%, and only centers with major surgical cases were included. The anesthesiologists included in the mailing list included general as well as subspecialty-trained physicians along with anesthesiology program directors. The general and subspecialized anesthesiologists were identified by their board certification status in Anesthesiology or by added certification in the subspecialty of anesthesiology through the American Board of Anesthesiology (www.theaba.org). The mix of responders included both academic and nonacademic anesthesiologists. The SurveyMonkey was launched three times 1 month a part if no responses were initially obtained. Questions for this survey are listed in [Table 1]. Nonresponders were ultimately contacted through direct E-mail after 1 month of E-mails through SurveyMonkey. The survey was closed at 6 months when 50% survey response rate or 125/250 responses were completed. We used nominal statistical data requiring a yes or no response. Nonparametric descriptive statistical analyses were performed, and cross-tabulation using Chi-squared tests were used for comparison. Data were expressed as numbers with percentages. Of the physicians that responded to the survey, 68 were male while 33 were female. Thirty-two anesthesiologists did not respond to the gender designation of the survey, which was optional. A cardiovascular anesthesiology group compromised half of the survey responders, and a critical-care-trained subspecialty anesthesiology group compromised 37 (28%) of the responders [Figure 1]. Out of 133, 78 responders (59%) were subspecialty trained, while still providing anesthesia for procedures involving general surgeries within their clinical practice. Residency graduating years were divided into four groups to assess providers' preferences in relation to clinical experience for CO monitoring: Group 1 graduated before 1980, Group 2 from 1981 to 1990, Group 3 from 1991 to 2000, and Group 4 from 2001 to 2017. The percentage that implemented CO monitoring was 5%, 13%, 26%, and 32% for Group 1, Group 2, Group 3, and Group 4, respectively. About 38% of the fellowship-trained physicians agreed to the implementation of CO monitoring within their practices. CO monitoring devices were used in 107 out of 133 physicians consisting of 42 physicians using only continuous monitoring methods while 24 implemented only intermittent monitoring methods and the rest used combined methods. Ninety-seven out of 133 anesthesiologists used CO monitoring for the management of fluid optimization and vasopressor support. The majority (84 out of 133 physicians) felt that CO monitoring was clinically beneficial in terms of monitoring response to treatment. Forty-eight anesthesiologists (44%) implemented pulmonary artery catheters (PAC). Esophageal Doppler (ED), PiCCO, Lithium Chloride Dilution CO (LiDCO), and inert gas rebreathing method (NICO) monitoring were used by 9%, 6%, 6%, and 2% of physicians, respectively. Pulse contour analysis of CO assessment was used by 30 out of 133 (23%) of physicians. TEE was used in 89 out of 133 (67%) and more than 50% of these responders expressed a desire to get certified in TEE by the National Board of Echocardiography. Other techniques such as Bio-Impedance/Bio-Reactant were used in 11% and 6% of cases, respectively. Semi-invasive CO monitoring with stroke volume assessment, specifically for variations has received increased attention in the field of anesthesiology and critical care medicine. Furthermore, creation and advancement of newer devices assessing CO have expanded and increased options for controlling and managing hemodynamic function. The application of newer and older CO monitoring devices varied significantly depending on clinical setting, availability, location, level of clinician experience, and the cost of the device. However, it is usually up to clinician and the anesthesiology service to decide which monitoring device is preferred for each practice. Our current survey was distributed at a Veterans Administration medical center among anesthesiologists practicing within different subspecialties. Similar surveys are conducted in the literatures, but none are comprehensive evaluating multiple CO monitors at veterans affairs (VA) facilities with high response rate. Surprisingly, it was noted that 44% of anesthesiologists used PAC monitoring for CO assessment. PAC implements a thermodilution method to assess CO, and it is the gold standard in clinical practice where all other monitoring devices are compared to PAC. However, the utilization of PAC has recently diminished after two landmark multicenter trials revealed no benefit within patient samples. Specifically, the largest trial by Sandham et al. found no benefit for PAC-guided therapy compared to standard care in elderly, high-risk surgical patients requiring intensive care. Studies even suggested that a lack of training with PAC among critical care physicians and nurses might actually result in harm to the patients., Plus, PAC requires auto-calibration, but frequent assessment of CO takes a longer time for rapid intervention in crisis scenarios. However, PAC is still used in many medical centers for teaching purposes since the clinical data obtained from PAC catheters provides a solid platform for teaching physiologic principles to medical residents and fellows. TEE was used frequently by cardiac anesthesiologists for assessment of CO and cardiac function, providing the most valuable clinical data for that setting. However, the implementation of TEE for other major cardiothoracic/vascular, or abdominal cases was not as popular for technical reasons, cost along with limited experience and comfort levels with the device among anesthesiologists. Among the less invasive CO monitoring devices, pulse contour analysis of CO by Vigileo/FloTrac (Edwards Lifescience Corp., Irvine. CA, USA) was the most frequently used semi-invasive technique within the study. FloTrac CO monitoring uses a mathematical algorithm for calculating CO. The initial studies for pulse contour assessment of CO were conducted and compared to PAC. The pulse contour device was found to have higher precision but lower accuracy for CO assessment. The device collects continuous data for CO assessment for short, 1 min intervals and does not require calibration like PAC. As a result, this method was considered a more valuable method for monitoring response to fluids or vasopressors when compared to PAC. Additional methods of CO monitoring were also evaluated and suggested a lower rate of utilization. These methods included the ED, NICO, PiCCO, LiDCO, and combination of bioimpedance and bioreactance technologies. The biggest disadvantages of bioimpedance devices are their sensitivity to motion and arrhythmogenic response to the use of electrocautery. PiCCO and LiDCO are used extensively within European markets, combining the pulse contour and thermodilution method to increase the accuracy of CO measurement., NICO has been implemented as more of a research tool as opposed to a clinical practice tool. There are limitations to this study since assessment for fluid responsiveness, and precision of CO monitoring for Vigileo/FloTrac device is only established when tidal volume of is 8cc/kilogram is used. Physicians generally implement this method in the operating room when patients are intubated, passively ventilated, and anesthetized. In addition, the survey was constructed with a “yes” and “No” answer. Therefore, it was impossible to record responses of different physicians with different subspecialties. Finally, the use and availability of CO devices depend on operator experience, price, and availability of certain monitors. It is now well established that CO monitors are additional tools an anesthesiologist can utilize to manage patients in perioperative period. There are abundant publications in anesthesia literatures about the utility of such devices in clinical practice. Our survey was mostly addressing operative phase of patient management. There are many factors that play into consideration for CO monitors utilization including cost, training, reliability, and experience. It is, however, our understanding that most VA medical centers are proud to have the ability to purchase and chose a device that is appropriate for their practice with full knowledge of limitation of each device. Therefore, we believe that this population surveyed reflects the true trends in the use of CO monitors. In addition, TEE is not a continuous monitor and has to be removed. However, the survey was mostly for anesthesiologist in the operating room where the TEE is available for frequent assessment. The TEE and PAC were used frequently for CO monitoring. The TEE use of 67% indicates its potential to be an important monitor for CO assessment. However, not all TEE users are certified. We believe that future pathways for certification of noncardiac anesthesiologist are desirable. Litton E, Morgan M. The PiCCO monitor: A review. Anaesth Intensive Care 2012;40:393-409. Mehta Y, Arora D. Newer methods of cardiac output monitoring. World J Cardiol 2014;6:1022-9. Biais M, Stecken L, Ottolenghi L, Roullet S, Quinart A, Masson F, et al. The ability of pulse pressure variations obtained with CNAP™ device to predict fluid responsiveness in the operating room. Anesth Analg 2011;113:523-8. Bilkovski RN, Rivers EP, Horst HM. Targeted resuscitation strategies after injury. Curr Opin Crit Care 2004;10:529-38. Abbas SM, Hill AG. Systematic review of the literature for the use of oesophageal Doppler monitor for fluid replacement in major abdominal surgery. Anaesthesia 2008;63:44-51. Hussien M, Refaat E, Fayed N, Yassen K, Khalil M, Mourad W. Use of transesophageal Doppler as a sole cardiac output monitor for reperfusion hemodynamic changes during living donor liver transplantation: An observational study. Saudi J Anaesth 2011;5:264-9. Rajaram SS, Desai NK, Kalra A, Gajera M, Cavanaugh SK, Brampton W, et al. Pulmonary artery catheters for adult patients in intensive care. Cochrane Database Syst Rev 2013;(2):CD003408. Harvey S, Young D, Brampton W, Cooper AB, Doig G, Sibbald W, et al. Pulmonary artery catheters for adult patients in intensive care. Cochrane Database Syst Rev 2006;(3):CD003408. Sandham JD, Hull RD, Brant RF, Knox L, Pineo GF, Doig CJ, et al. Arandomized, controlled trial of the use of pulmonary-artery catheters in high-risk surgical patients. N Engl J Med 2003;348:5-14. Iberti TJ, Daily EK, Leibowitz AB, Schecter CB, Fischer EP, Silverstein JH. Assessment of critical care nurses' knowledge of the pulmonary artery catheter. The pulmonary artery catheter study group. Crit Care Med 1994;22:1674-8. Gnaegi A, Feihl F, Perret C. Intensive care physicians' insufficient knowledge of right-heart catheterization at the bedside: Time to act? Crit Care Med 1997;25:213-20. 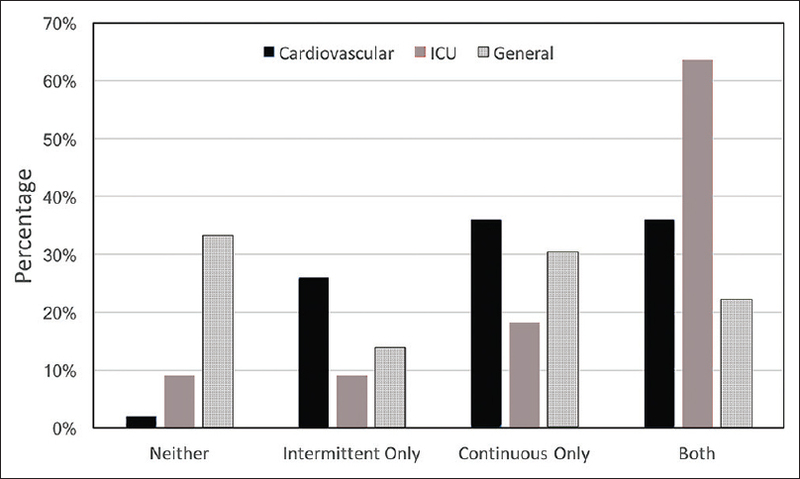 Singh A, Juneja R, Mehta Y, Trehan N. Comparison of continuous, stat, and intermittent cardiac output measurements in patients undergoing minimally invasive direct coronary artery bypass surgery. J Cardiothorac Vasc Anesth 2002;16:186-90. Khera R, Pandey A, Kumar N, Singh R, Bano S, Golwala H, et al. Variation in hospital use and outcomes associated with pulmonary artery catheterization in heart failure in the United States. Circ Heart Fail 2016;9. pii: e003226. Júnior CG, Botelho ES, Diego LA. Intraoperative monitoring with transesophageal echocardiography in cardiac surgery. Rev Bras Anestesiol 2011;61:495-512. Rebel A, Klimkina O, Hassan ZU. Transesophageal echocardiography for the noncardiac surgical patient. Int Surg 2012;97:43-55. Afshari A, Perner A, Bonde J. Circulation monitoring of critically ill patients with the pulse contour cardiac output system. Ugeskr Laeger 2006;168:1746-9. Zimmermann A, Kufner C, Hofbauer S, Steinwendner J, Hitzl W, Fritsch G, et al. The accuracy of the Vigileo/FloTrac continuous cardiac output monitor. J Cardiothorac Vasc Anesth 2008;22:388-93. Argueta E, Berdine G, Pena C, Nugent KM. FloTrac® monitoring system: What are its uses in critically ill medical patients? Am J Med Sci 2015;349:352-6. Auler JO Jr., Galas F, Hajjar L, Santos L, Carvalho T, Michard F. Online monitoring of pulse pressure variation to guide fluid therapy after cardiac surgery. Anesth Analg 2008;106:1201-6.
van Heerden PV, Baker S, Lim SI, Weidman C, Bulsara M. Clinical evaluation of the non-invasive cardiac output (NICO) monitor in the Intensive Care Unit. Anaesth Intensive Care 2000;28:427-30. Pearse RM, Ikram K, Barry J. Equipment review: An appraisal of the LiDCO plus method of measuring cardiac output. Crit Care 2004;8:190-5. Jakovljevic DG, Trenell MI, MacGowan GA. Bioimpedance and bioreactance methods for monitoring cardiac output. Best Pract Res Clin Anaesthesiol 2014;28:381-94. Nakamura T. Cardiac index monitoring by pulse contour analysis: 2. PiCCO. Masui 2009;58:848-53. Marik PE, Cavallazzi R, Vasu T, Hirani A. Dynamic changes in arterial waveform derived variables and fluid responsiveness in mechanically ventilated patients: A systematic review of the literature. Crit Care Med 2009;37:2642-7. Porhomayon J, Papadakos P, Nader ND, El-Solh AA. Weaning failure: My heart is not up to it. Chron Respir Dis 2013;10:165-74. Pearse RM, Harrison DA, MacDonald N, Gillies MA, Blunt M, Ackland G, et al. Effect of a perioperative, cardiac output-guided hemodynamic therapy algorithm on outcomes following major gastrointestinal surgery: A randomized clinical trial and systematic review. JAMA 2014;311:2181-90. Noblett SE, Snowden CP, Shenton BK, Horgan AF. Randomized clinical trial assessing the effect of Doppler-optimized fluid management on outcome after elective colorectal resection. Br J Surg 2006;93:1069-76.